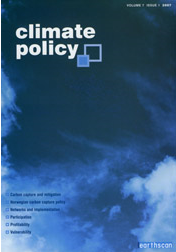 LCS-RNet complied the latest research results and findings of climate policies based on scientific evidence in the special issue of the leading international, peer-reviewed journal on responses to climate change, “Climate Policy: Low Carbon Drivers for a Sustainable World, ” Climate Policy Special Issue Volume 13, Supplement 1 2013 . Climate policies in a changing world context: is a paradigm shift needed? The Special Issue addresses various perspectives of global vision to achieve low carbon growth and development, the link between low-carbon development, sustainable development and the environment, and the role of technology, behaviour and societal dynamics in promoting change. This Issue includes analysis of financial system and policy determinants for a transition towards a low carbon society, potentials for China to support global 2 degree target of the Cancun agreement, recommendations for mitigation policy in Brazil, impact to investment risk for the development of low-carbon technologies in England, transportation policy designing settlements so as to reduce mobility needs, low carbon policy in Germany to decarbonise its electricity system without recourse to nuclear power or CCS.